Christine Thomas received her B.S. in chemistry from Lafayette College (Easton, PA) in 2001, where she worked on the synthesis and electrochemistry of inorganic compounds with Professor Chip Nataro. She received her Ph.D. inorganic chemistry in 2006 at the California Institute of Technology (Pasadena, CA) under the direction of Professor Jonas C. Peters. Her graduate research focused on a wide range of synthetic projects related to inorganic and organometallic chemistry, including the examination of C-H activation by platinum complexes, the design of new ligands, the examination of the reactivity of coordinatively unsaturated tris(phosphino)borate iron complexes towards small molecule activation, and the synthesis of the first well-defined and structurally characterized Fe(IV) imido complex. Christine went on to pursue postdoctoral work under the direction of Professors Marcetta Y. Darensbourg and Michael B. Hall at Texas A&M University (College Station, TX), where her postdoctoral research concentrated on the experimental and theoretical investigation of small molecule models of the dinuclear active site of [FeFe]-Hydrogenase, an enzyme that catalyzes the reversible production of hydrogen from protons. 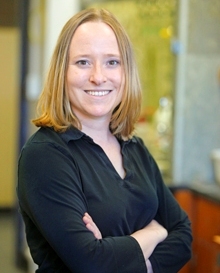 In 2008, Christine began her career as an Assistant Professor of Chemistry at Brandeis University (Waltham, MA). Christine was selected for DOE's Early Career Research Program in 2011, was named a 2011 Alfred P. Sloan Fellow, and received an NSF CAREER award in 2012. She was selected as a 2012 Organometallics Fellow, was named a 2013/2014 Chemical Communications Emerging Investigator, was named a Fellow of the Royal Society of Chemistry in 2014, and was selected for the 2015 Dalton Transactions Lectureship. Christine's dedication to teaching has also been recognized by the 2012 Michael L. Walzer '56 Award for Excellence in Teaching at Brandeis University. At Brandeis University, Christine was promoted to Associate Professor with tenure in May 2013 and to full Professor in July 2016. She has been on the Editorial Advisory Board of Chemical Communications since 2012, is on the Board of Directors of Inorganic Syntheses, and has been serving as an Associate Editor of Dalton Transactions since 2014. Christine will join the Department of Chemistry and Biochemistry in January 2018. As a method to address the fundamental challenge of designing catalysts for multielectron redox transformations, our group has been investigating well-defined bimetallic systems to learn more about the fundamental interactions between these two metals and how such interactions might be used to promote multielectron redox chemistry and determine the mechanism by which small molecules might interact with the two metal sites to facilitate the cleavage of s and p bonds. While we are primarily interested in investigating homogeneous catalyst design strategies, our ultimate goal is to provide insight into some of the interactions and mechanistic pathways that might also be at play in heterogeneous catalysis where multiple metal sites are certainly present and involved in catalysis. Ongoing research involves the synthesis of new homo- and heterobimetallic complexes featuring metal-metal interactions, spectroscopic and computational studies into the electronic structure and metal-metal bonding in these complexes, and the exploration of the reactivity of these new heterobimetallic platforms towards unusual bond activation processes and catalytic transformations. Research in the Thomas lab also focuses on the synthesis and coordination chemistry of new class of bis- and tri-dentate ligands incorporating a central N-heterocyclic phosphenium (NHP+) unit. While catalytic applications of N-heterocyclic carbene (NHC) ligands have been explored extensively, their phosphorus analogues NHP+s have not been evaluated in transition metal catalysis, and far less is known about their coordination chemistry. Prof. Thomas and coworkers have designed a NHP+-containing ligands with one or two phosphine sidearms as a method to impart stability and enforce transition metal coordination to allow more extensive studies into the transition metal chemistry of NHP+ ligands. The Thomas group has shown that NHP ligands can adopt two coordination modes: planar, indicative of an NHP+ phosphenium description, and pyramidal, indicative of an NHP- phosphido description. Similar to nitrosyl ligands, the two NHP coordination geometries correspond to metal formal oxidation states that differ by two electrons. Thus, NHP ligands have the potential to serve as non-innocent ligands, participating in redox transformations via switching coordination geometry. Researchers in the Thomas lab are investigating the coordination chemistry of the new NHP-diphosphine ligands with a variety of transition metals to evaluate the factors that dictate the preferences for planar vs. pyramidal geometries. DFT and NBO calculations are used to better understand the metal-ligand interactions in these complexes. In addition, we assess the redox activity of transition metal NHP complexes using cyclic voltammetry to explore the possibility of ligand-based redox activity. The group has also recently found that, in addition to redox-noninnocence, the NHP ligands are active participants in metal-ligand cooperative reactions. Culcu, G.; Iovan, D. A.; Krogman, J. P.; Wilding, M. J. T.; Bezpalko, M. W.; Foxman, B. M.; Thomas, C. M. "Heterobimetallic Complexes Comprised of Nb and Fe: Isolation of a Coordinatively Unsaturated NbIII/Fe0 Bimetallic Complex Featuring a NbºFe Triple Bond." J. Am. Chem. Soc. 2017, 139, 9627-9636. Bezpalko, M. W.; Poitras, A. M.; Foxman, B. M.; Thomas, C. M. "Cobalt N-Heterocyclic Phosphenium Complexes Stabilized by a Chelating Framework: Synthesis and Redox Properties." Inorg. Chem. 2017, 56, 503-510. Evers-McGregor, D. A.; Bezpalko, M. W.; Foxman, B. M.; Thomas, C. M. "Exploring the Coordination Chemistry of N-Heterocyclic Phosphenium/Phosphido Ligands Using Nickelocene as a Synthon." Inorg. Chim. Acta. 2017, 460, 17-21. Wu, B.; Wilding, M. J. T.; Bezpalko, M. W.; Foxman, B. M.; Thomas, C. M. "Exploring Trends in Metal-Metal Bonding, Spectroscopic Properties, and Conformational Flexibility in a Series of Heterobimetallic Ti/M and V/M Complexes (M = Fe, Co, Ni, and Cu)." Inorg. Chem. 2016, 55, 12137-12148. Krogman, J. P.; Bezpalko, M. W.; Foxman, B. M.; Thomas, C. M. "Multi-Electron Redox Processes at a Zr(IV) Center Facilitated by an Appended Redox-Active Cobalt-Containing Metalloligand." Dalton Trans. 2016, 45, 11182-11190. Saper, N. I.; Bezpalko, M. W.; Foxman, B. M.; Thomas, C. M. “Synthesis of Chiral Heterobimetallic Tris(Phosphinoamide) Zr/Co Complexes.” Polyhedron, 2016, 114, 88-95. Evers-McGregor, D. A.; Bezpalko, M. W.; Foxman, B. M.; Thomas, C. M.* “N-Heterocyclic Phosphenium and Phosphido Nickel Complexes Supported by a Pincer Ligand Framework.” Dalton Trans. 2016, 45, 1918-1929. Wu, B.; Gramigna, K.; Bezpalko, M. W.; Foxman, B. M.; Thomas, C. M. “Heterobimetallic Ti/Co Complexes That Promote Catalytic N-N Bond Cleavage.” Inorg. Chem. 2015, 54, 10909-10917. Bezpalko, M. W.; Foxman, B. M.; Thomas, C. M. “Use of Bidentate Ligand Featuring an N-Heterocyclic Phosphenium Cation (NHP+) to Systematically Explore the Bonding of NHP+ Ligands with Nickel.” Inorg. Chem. 2015, 54, 8717-8726. Krogman, J. P.; Foxman, B. M.; Thomas, C. M. “Formation and Subsequent Reactivity of a N2-Stabilized Cobalt Hydride Complex.” Organometallics 2015, 34, 3159-3166. Wu, B.; Bezpalko, M. W.; Foxman, B. M.; Thomas, C. M. “A Heterobimetallic Complex Featuring a Ti-Co Multiple Bond and Its Application to the Reductive Coupling of Ketones to Alkenes.” Chem. Sci. 2015, 6, 2044-2049. Krogman, J. P.; Thomas, C. M. “Metal-Metal Multiple Bonding in C3-Symmetric Bimetallic Complexes of the First Row Transition Metals.” Chem. Commun. 2014, 50, 5115-5127.